We had a Gray Fox visit our bird feeder at dawn! He was tiny. Maybe a little over a foot high and two feet long including his fluffy tail. In Michigan we have the Gray and Red Foxes. Red is spotted more often but that may be because the gray blends in so well with the surroundings. I only spotted him because I saw fast motion from the pond to the feeder and then a head that made jerky, secretive back and forth motions. As the sun rose I could see he was working slowly and deliberately, on a seed block but paused frequently to scan the yard. He blended in perfectly with the trunks of the trees. With more light I could see a little red around the neck but he was mostly gray. The gray fox has pale feet and legs, and a black tipped tail. The red fox, of course, is redder and has black stocking feet and a white tipped tail. 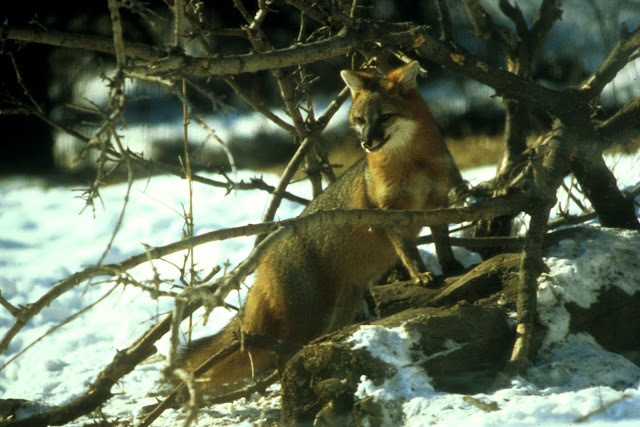 According to http://www.biokids.umich.edu: "Gray foxes breed once a year in March. Both male and female gray foxes take care of their offspring. Before birth, males do the majority of hunting, and females look for and prepare a den. Females nurse their young for 2 to 3 weeks. Pups begin eating solid food around 3 weeks of age, and this food is mainly provided by the father. Parents teach pups how to hunt at around 4 months of age. Until then, both parents hunt for food separately, and pups practice their hunting skills by pouncing and stalking, which is primarily taught by the father. Pups depend on their parents for defense until about 10 months of age. At this point, they are capable of reproducing and they leave their parents." Gray foxes prefer to live in deciduous forests interspersed with brushy, woodland areas. But with more areas being developed, animals are being forced to share human territories more and more.